AFTER EVOLVING SINCE Buddhism first arrived in the 6th century, Japanese religious sculpture reached a peak of skill and artistic expression during the Kamakura period (1185–1333), but then gradually slid into a decline through subsequent centuries, becoming derivative and uninspired. Two later sculptors, Enku (1632-95) and Mokujiki (1718-1810) proved exceptions to the rule by breaking away from the standard ‘carving by numbers’, imitative approach to making religious imagery, and developing their own distinctive styles. Now, following a successful exhibition of Buddhist sculptures in 2006 when these artists’ work was displayed, the Tokyo National Museum will be showing a special exhibition of Enku›s works from the Senkōji Temple and the surrounding area in present-day Gifu Prefecture, during early 2013. Enku was born in what is present-day Gifu Prefecture and became a monk at an early age to study Mikkyo – the teachings of Esoteric Buddhism much associated with magic ritual, mysticism and various ascetic practices that were handed down from a master to whichever pupils he thought suitable. One of the central teachings of Mikkyo – at odds with those of other sects – was that by following the right path of religious practice, an adept could bypass the usual countless reincarnations and achieve enlightenment with just one lifetime. For most ordinary people this central tenet was sufficient focus for their faith, leaving the bewildering complications of esoteric teaching to temple clerics. During Enku’s lifetime, Japan was unified under the Tokugawa shogunate whose governance was administered by a powerful bureaucracy known as the bakufu. Under central command, Christianity had been outlawed and various controls were put in place to discourage its revival. One of these was to sponsor and encourage the activities of Buddhist temples whose clerics were best placed to know what was going on in their local community. As the 18th century saw the rise of a merchant/craftsman class and a resultant booming economy, temples found themselves better funded than they had been for several hundred years and were able to restore or rebuild temples as well as commission the production of Buddhist images. Traditional schools of sculptors descending from a Kamakura lineage supplied the great temples and the households of war-lords and the nobility, while lesser-endowed and small regional temples commissioned works from whatever craftsmen could be found locally. Buddhist images reflected the wealth and patronage of a temple, with those most elevated being able to afford statues finely-carved by master craftsmen in traditional forms, lacquered and covered in pure gold leaf and adorned with bronze or gilt accessories. This time also coincided with an increasing experimentation in Japanese arts, in particular those of painting, ceramic-making and accoutrements of the tea ceremony and the emergence of eccentricity and individuality. 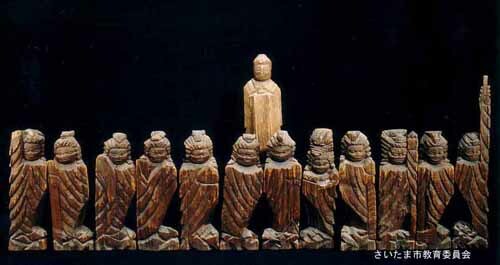 Enku was the first in the field of Buddhist sculpture to break away from traditional techniques, achieving widespread fame for his highly-expressive images, simply hewn with axe and chisel from single chunks of wood. 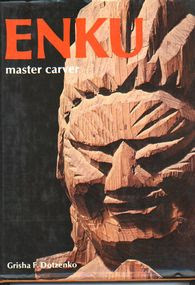 Enku is reputed to have carved over 120,000 images during his lifetime and many were given in payment for lodging on his pilgrimages to temples throughout the mountainous ‘snow country’ of rural Japan. He chose mainly pine wood logs if they were locally available, possibly because they are easily split lengthways with an axe into pieces with a roughly triangular cross-section. Large pieces were used for more elaborate carving while smaller fragments were carved very simply with just a few axe or chisel cuts to indicate eyes, eyebrows and mouth. Even though crude compared to the traditional, naturalistic manner of religious carving, Enku’s works appealed – and still do so – with their warmth and heart-felt sincerity. Flaws, knots, or even naturally interesting shapes, were incorporated by Enku into his works so that even though far from naturalistic, they exude an expressive honesty that no doubt touched the hearts of the faithful far more than aloof images in the great temples. Almost none of his statues are painted or gilded, and the rustic ‘woodiness’ plus the rough hatchet-marks of his technique hint at the poverty of rural life during pre-modern times. Apart from a few guardian deities, whose fang-in-cheek grimaces frighten no-one, the most noticeable characteristic of his statues is a soft, benevolent smile that surely comforted all who saw them, especially the troubled and dying to whom he gave many of his smaller pieces. Enku spent some time during his later life at Senkōji temple where he carved over 60 statues. Most of these will be on show at the Tokyo National Museum together with other locally sourced works, some of which are inscribed with the names of mountains climbed by Enku on his travels and pilgrimages. The most important work to be seen for the first time out of its temple home is a statue of Ryomen Sukuna who founded Senkōji temple some 1,600 years ago, shown holding an axe and displaying two faces to underscore his deified nature.